I can't believe I have almost 100 followers!!! I want to thank each and everyone of you so much for following my blog! To celebrate this accomplishment, I'm hosting my first giveaway ever (open to everyone in the world)! 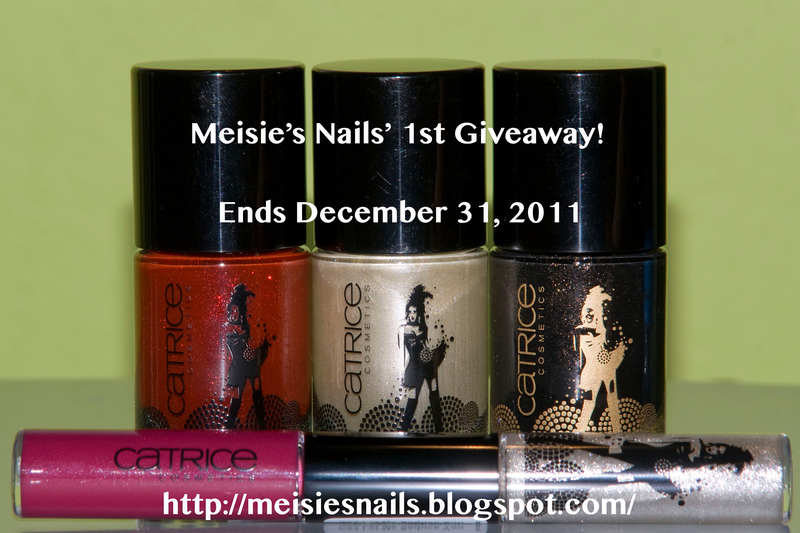 3 Catrice Nail Polishes (C01 Lovely Sinner, C03 Star of the Show, C04Drama Queen) + 1 duo lipgloss (C03 Let Me Seduce You) from the Welcome to Las Vegas Limited Edition!!! These are so pretty! Congrats on almost reaching 100! Awesome giveaway! Congrats on 100 followers! What a great way to celebrate 100 follower milestone. Great giveaway. Congrats feel free to share on my fanpage anytime hun!! Congrats! I love your layout BTW! done.... hope to winnnnnnn !!! Congrats on the followers and thank you very much for the giveaway!! :) I love the pink, fuchsia and purple nail polishes on the sides of your blog! Entered! thanks! :* happy holidays!